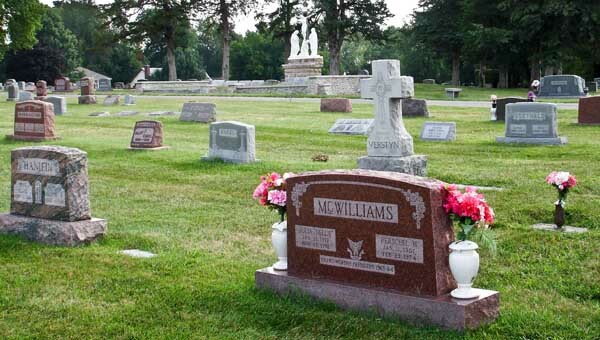 Catholic Cemeteries of Northeast Kansas offers a comprehensive line of burial vaults which are required in all of the archdiocesan Catholic Cemeteries. Catholic Cemeteries of Northeast Kansas offers a comprehensive line of burial vaults which are required in all of the archdiocesan Catholic Cemeteries. We have several types which include the traditional burial vaults made of concrete, along with those made of polypropylene. For those families who prefer a more distinctive burial vault, Catholic Cemeteries offers several different styles of lined vaults made of stainless steel, copper and even bronze. For our Catholic Veterans, Catholic Cemeteries can also provide families with a burial vault commemorating an individual’s service in the Armed Forces. Burial vaults serve a variety of purposes. By placing all caskets or cremation urns in a vault, protection against future settling of the grave has been achieved. This fundamental Catholic Cemetery rule preserves, as best as can be, the beauty of the Catholic Cemetery as well as the safety of all who walk within the Catholic Cemetery grounds. In the selection process of the vault, families achieve additional peace of mind knowing that an elevated level of protection for the casket/urn has occurred. In addition, choosing a lined burial vault offers long lasting protection needed to resist elements including water and the weight from heavy equipment over time. We should also note here that there exists a major difference between a lined vault and a simple grave box/liner (our minimum requirement). Please consult with your Catholic Cemeteries of Northeast Kansas professional cemetery counselor to learn the difference.